Podlasek has put down his barber shears. “Life has been good to me. I can’t complain,” Podlasek said as he sat in his iconic shop, closed since April, when health concerns—both Stan’s and his wife of 67 years—forced his retirement at age 89. He turned 90 in September. He attended St. Bruno School and Tilden Tech. He has one brother, a Garfield Ridge resident still going strong at age 93. After his father died, Podlasek took over the tavern in 1951 and ran it for nine years. An uncle ran Podlasek’s grocery store nearby. That same year, he and his wife moved into a house near 54th and Oak Park, when new homes were sprouting up quickly in what had been a vast Garfield Ridge prairie. Over the years, they were blessed with four daughters and a son; and later, grandchildren and great-grandchildren. He attended barber college and worked in Hinsdale for several years before building his own shop on Archer—a twin storefront: half for his shop and half an income property. The unmistakable glow of Stan's blue neon sign, in a SWCP photo from 2011. Stan’s Barber Shop opened just after Christmas 1965—not the best time for barbers, especially new ones trying to get a toehold in business. With the Beatles, Rolling Stones and other British Invasion rock stars sporting longer hairstyles, millions of boys across the U.S. starting growing their hair over the ears—and then to their shoulders as the hippie styles reached their peak during the Summer of Love in 1967. “Yeah, it was something,” Podlasek recalled with a chuckle. He tells the tale of a time when one of his daughters’ young suitors stopped by the house for the first time. “So my wife meets him at the door. She looks at him. He’s got hair down to his shoulders,” Podlasek recalled. “My wife says, ‘You know what my husband does for a living? He’s a barber. Why don’t you go see him?’ My wife was always a character,” he adds with a chuckle. Today, the young man—now sporting a short and stylish cut—is his longtime son-in-law. Just about the longest-running business in Garfield Ridge, Podlasek can look out his window and tell visitors what used to be at any given location. MacNeal Hospital’s clinic used to be Jewel Foods. Dr. Coler’s chiropractic office used to be Normandy Deli and Widen’s Bakery. The day care center across the street used to be a shop that made prosthetic eyes; and before that, it was a tailor/dry cleaner’s. Before 1976, Obbie’s Pizza was Geno’s Pizza. And on he goes, a living history book of Garfield Ridge commerce. While Podlasek has retired, the barber pole has started spinning again at his shop. 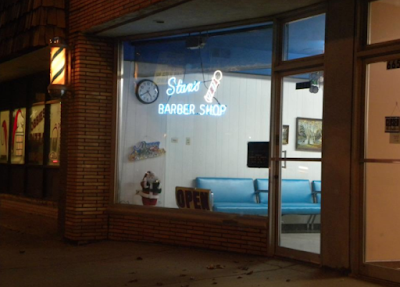 A younger barber is renting the space and has decided to keep the “Stan’s Barber Shop” name and sky-blue neon sign.